← Happy Birthday, Paul Erdos! Happy Birthday to Leonhard Euler! What can I say about Leonhard Euler that hasn’t already been said? Not much. Born in Basel, Switzerland on April 15, 1707, Euler showed his mathematical talents early. By the age of 7, Euler’s father hired a private mathematics tutor to work with him. By the age of 13, Euler was attending lectures at the University of Basel. Once finished at the University, Euler spent most of his professional career in Russia at the St. Petersburg Academy of Sciences. During his career, Euler made significant contributions to the fields of analytic geometry, geometry, number theory, trigonometry and calculus as well as in several areas of physics. All was not smooth sailing for Euler, however. In 1738, he lost one of his eyes in an accident from an experiment involving light diffraction. In 1771, Euler contracted an illness that left him almost completely blind in his remaining eye. 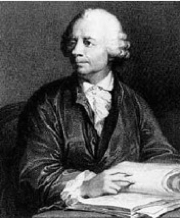 However, despite being essentially blind, Euler still managed to produce hundreds of original mathematical papers. By the time of his death in 1783, Euler is credited with over 900 mathematical publications. He was so prolific a mathematician that the St. Petersburg Academy of Sciences continued to publish his work for nearly 50 years after his death! 5 Responses to Happy Birthday, Leonhard Euler!